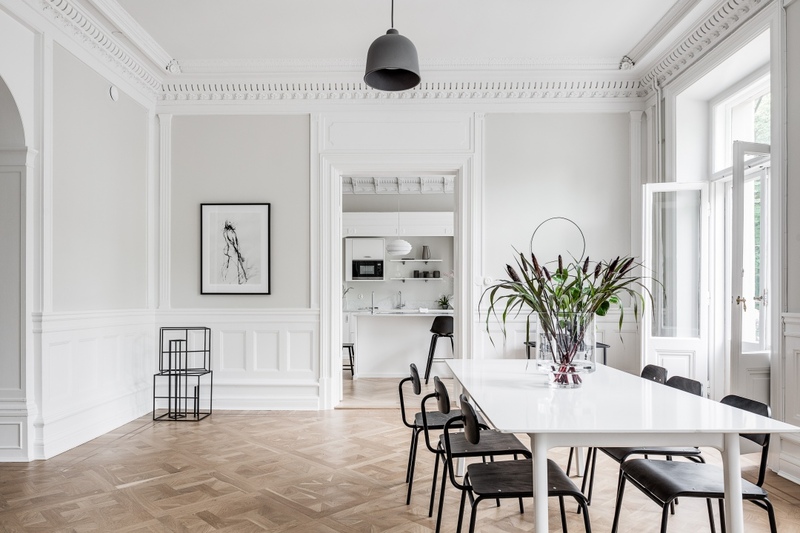 The turn of the century details in this light filled apartment are absolutely stunning. 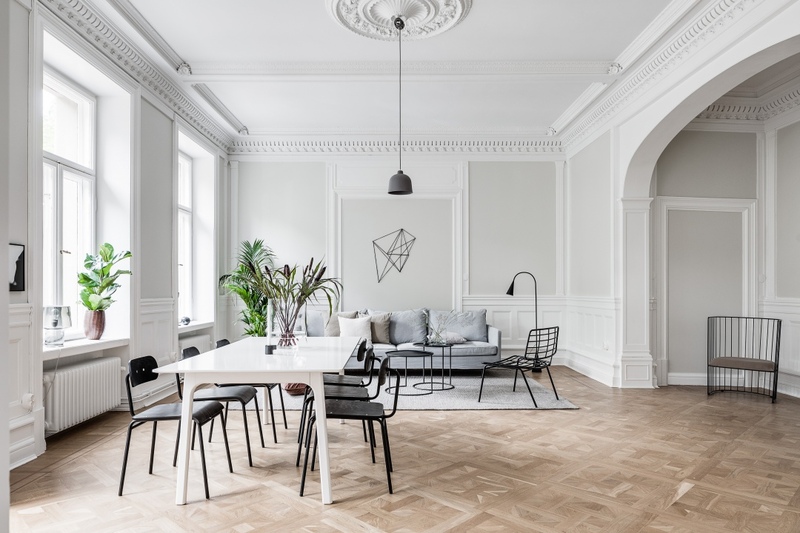 The details on the wall and ceilings are very present and perfectly enhanced by keeping the furnishings relatively minimal. 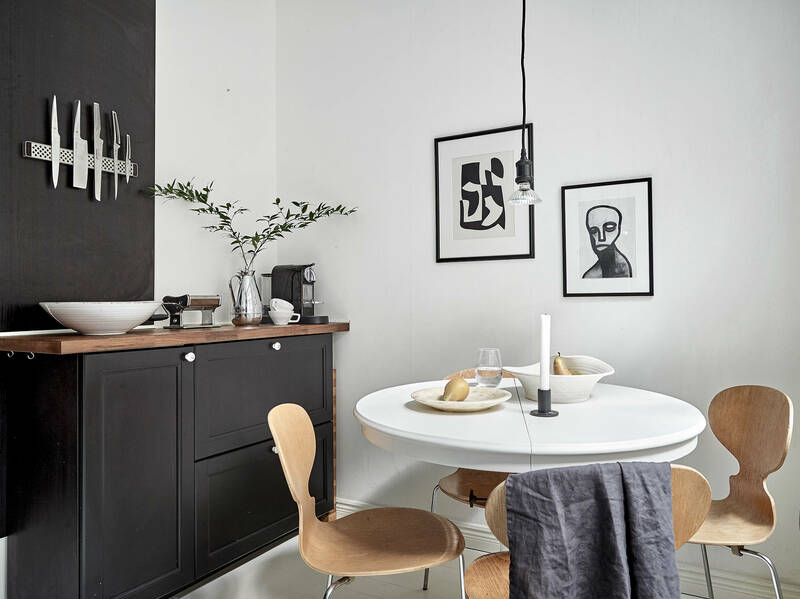 The black furniture throughout adds a nice contrast to the beige and white walls and the kitchen was perfectly fitted within the original mouldings and details that were there. 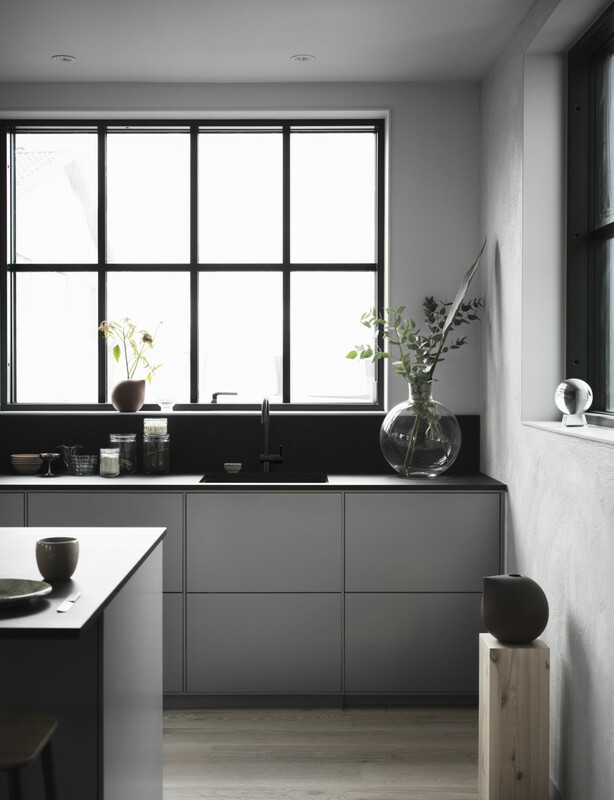 I like this combination of modern and old. 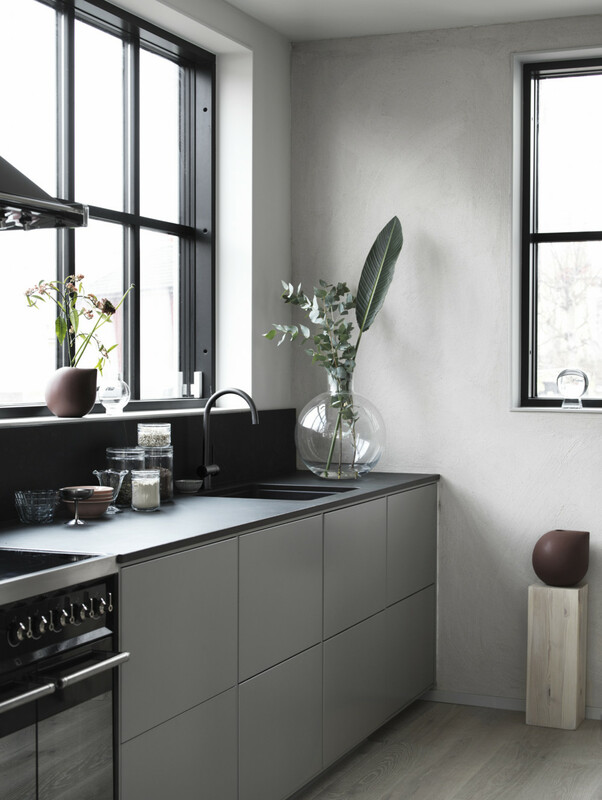 I’m so inspired by this industrial, yet minimal Ballingslöv kitchen. 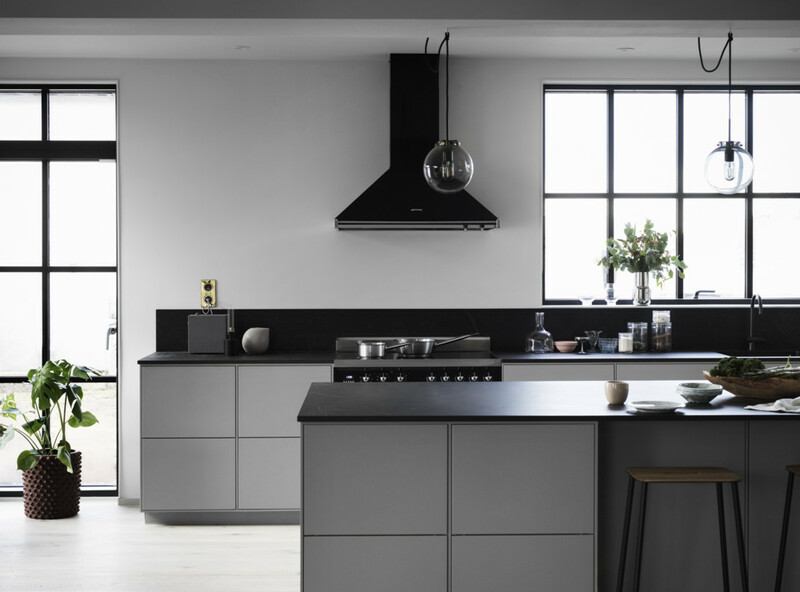 The black and grey fronts and worktop match perfectly with the concrete walls and the large black frame windows. 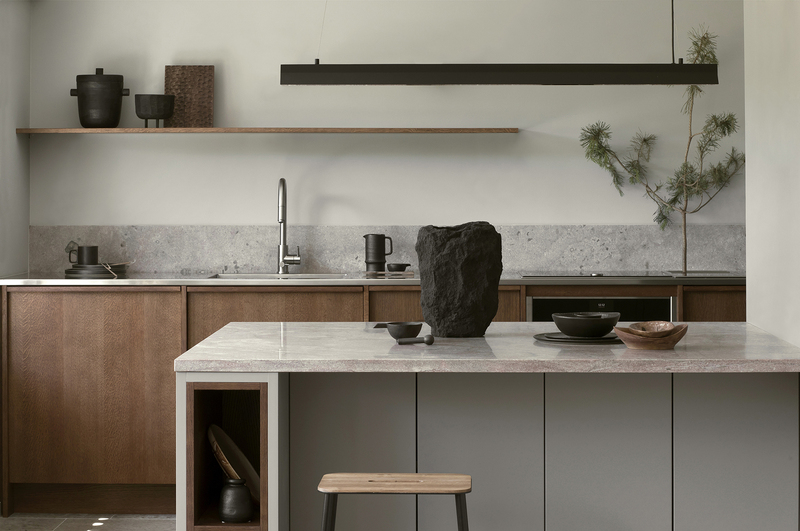 I like the little bench with the plants in the corner a lot and wish I could fit something like that in my kitchen. 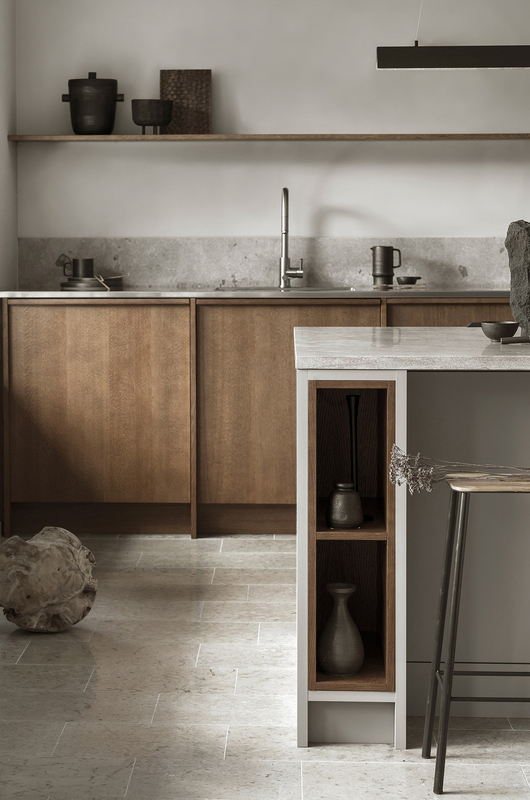 The large kitchen island is a really cool feature as well and the Frama bar stools fit perfectly with this look. 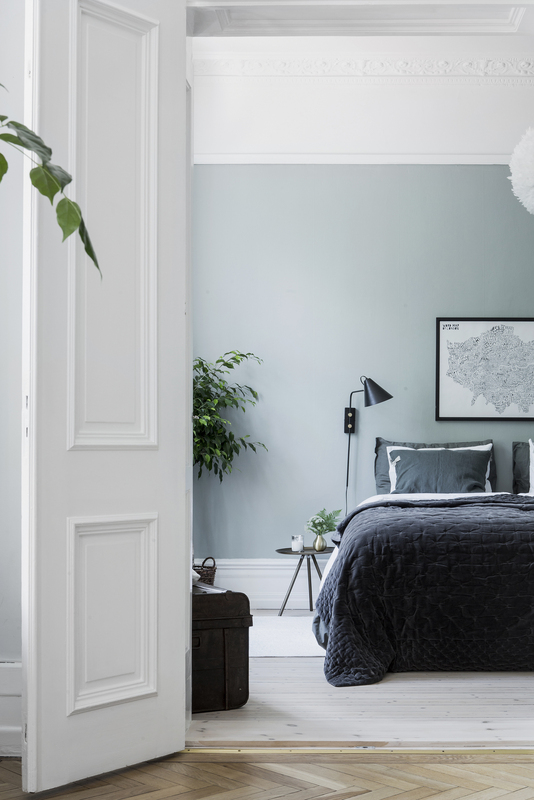 I like this cozy bedroom painted in a greenish grey. The grey bedding adds some softness to this look and the green plants make the space look very fresh. The plants look very nice against the wall color as well. 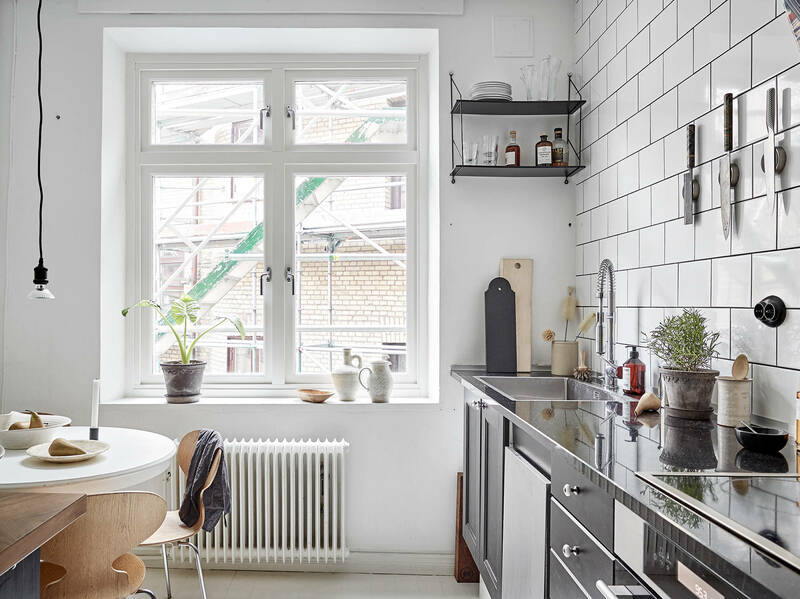 One of my favorite Finnish bloggers, Maiju just recently moved into her new home and I’m so happy to see that our Begonia Maculata art print has found a place already in her stylish place. Maju blogs about the progress in her home, which is really nice to follow if you are interested. 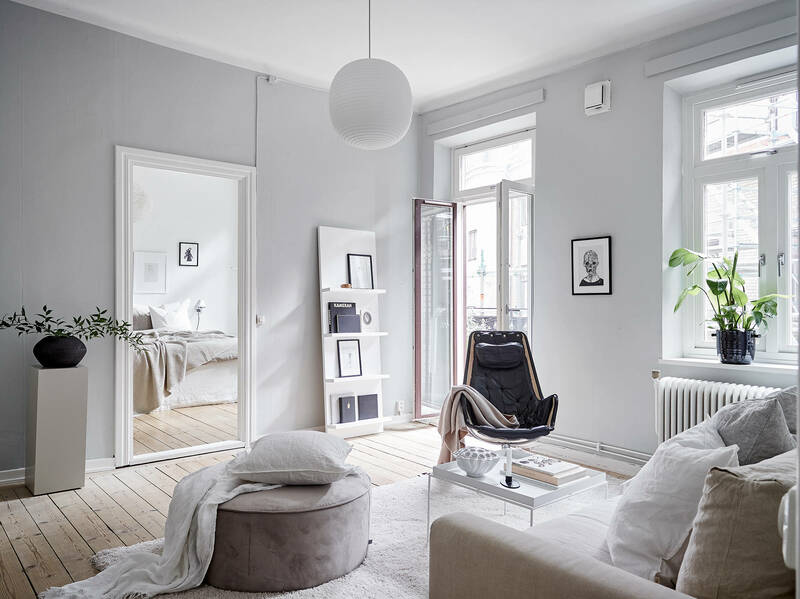 Beige and grey tints are very nice palettes used separately but I feel like they are even better when combined together like in this cozy and inviting apartment. 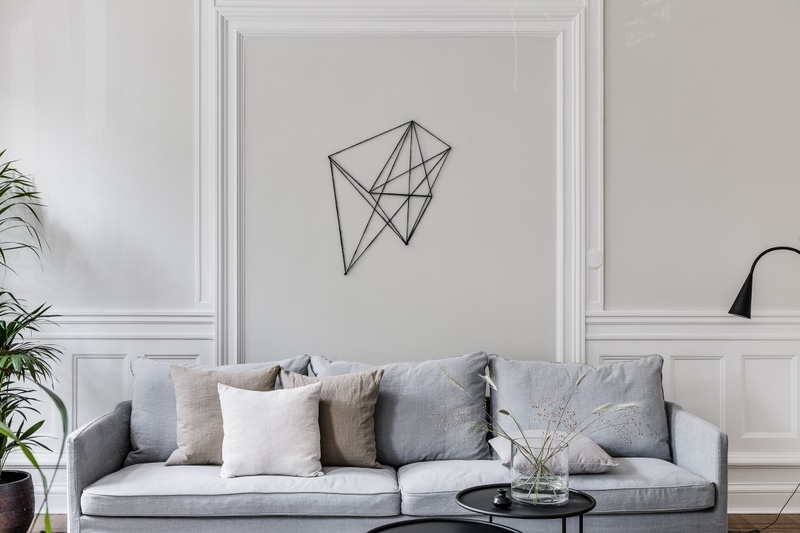 The light beige sofa works really well against the light grey wall and in combination with the neutral accessories and black accent pieces. 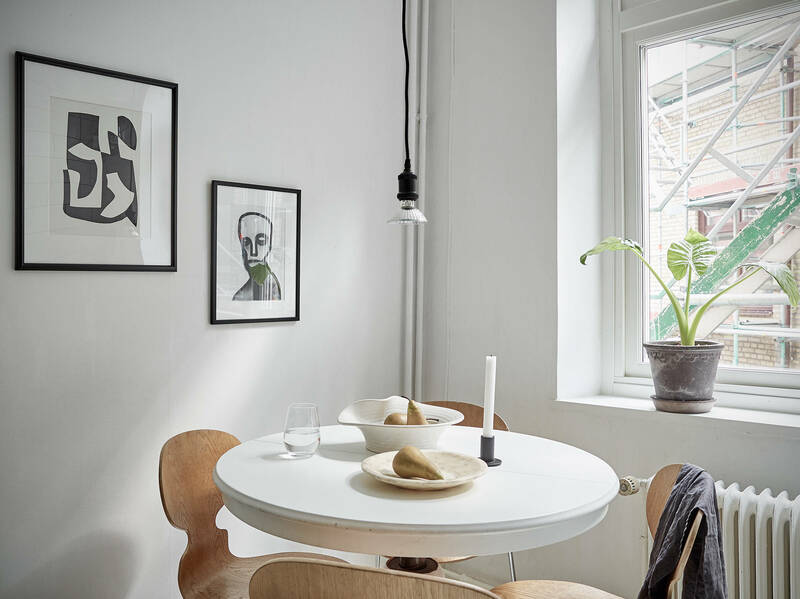 The bedroom walls are kept white which looks very fresh in combination with the beige bedding and I like the vintage dining table with the wooden chairs in the kitchen as well. 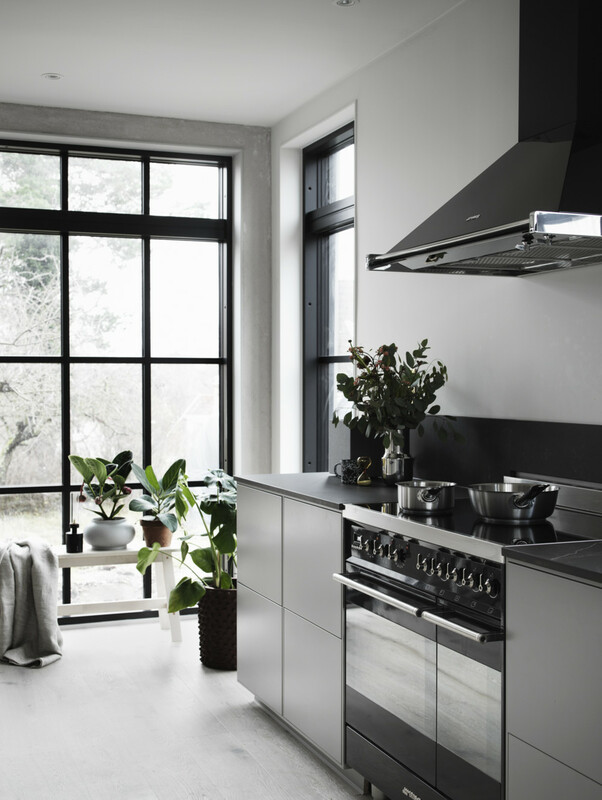 This is the latest work of stylist Josefin Hååg and photographer Emily Laye for Swedish bedroom textile brand Midnatt. 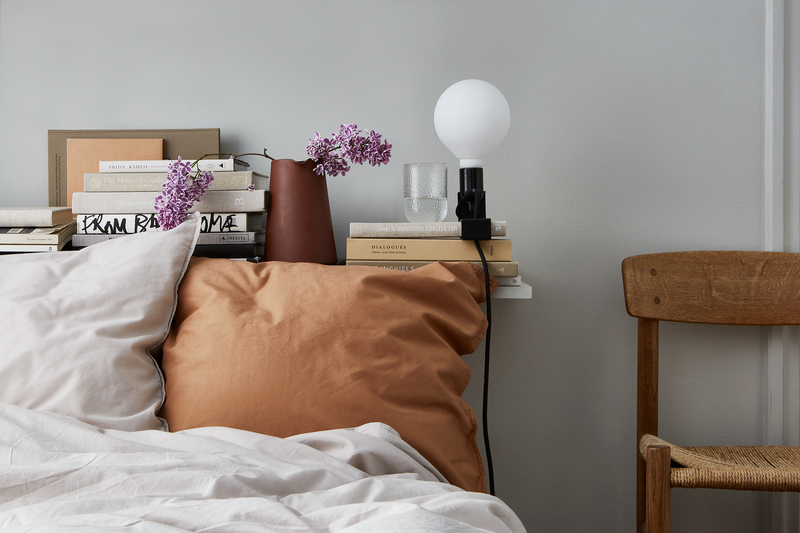 The peach and beige tones are perfect for summer and are so nicely portrayed in these stylish setups. 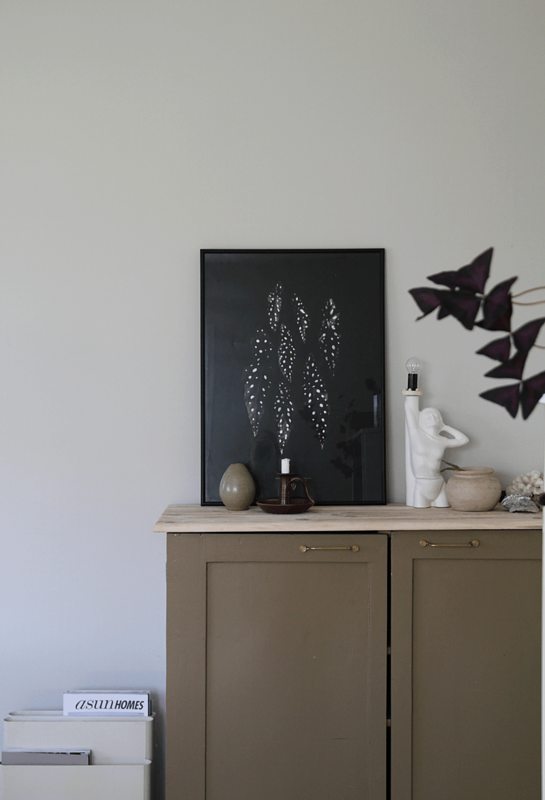 I think you can recognise Josefin’s stylish accent pieces in these pictures and I love the delicate summer vibe that is going on here. 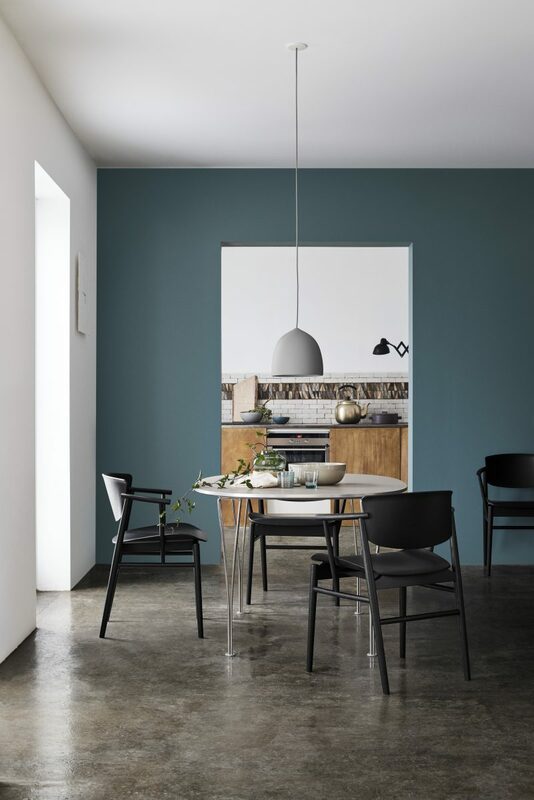 The N01 chair is designed by Japanese studio Nendo for Fritz Hansen and was created by the merging of Danish and Japanese aesthetics and purity. 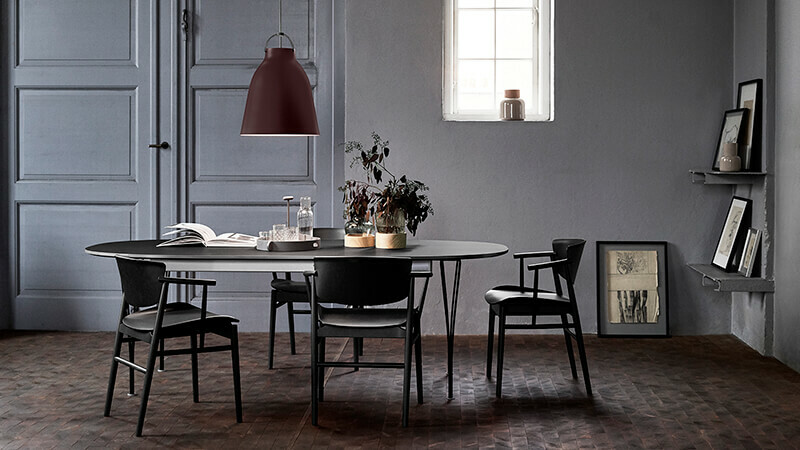 The chair brings back nature and embraces today’s modern life. 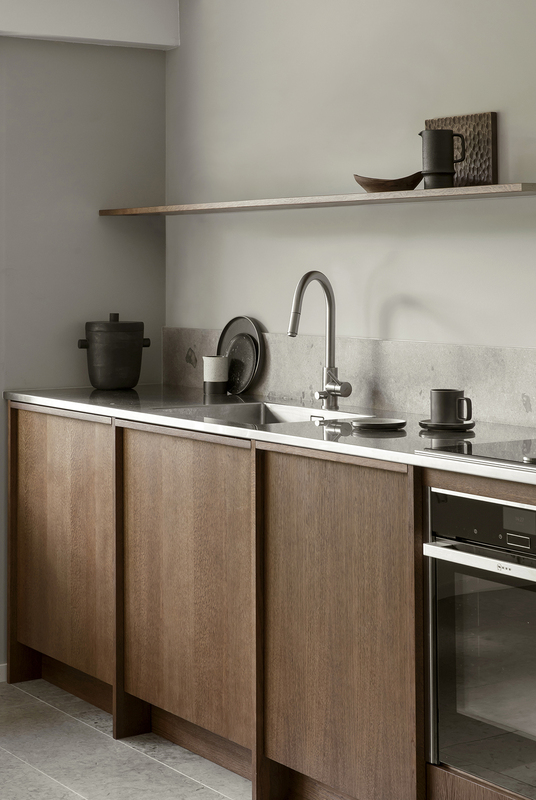 This is the latest kitchen project of Swedish kitchen brand Nordiska Kök in a beautiful dark oak finish. 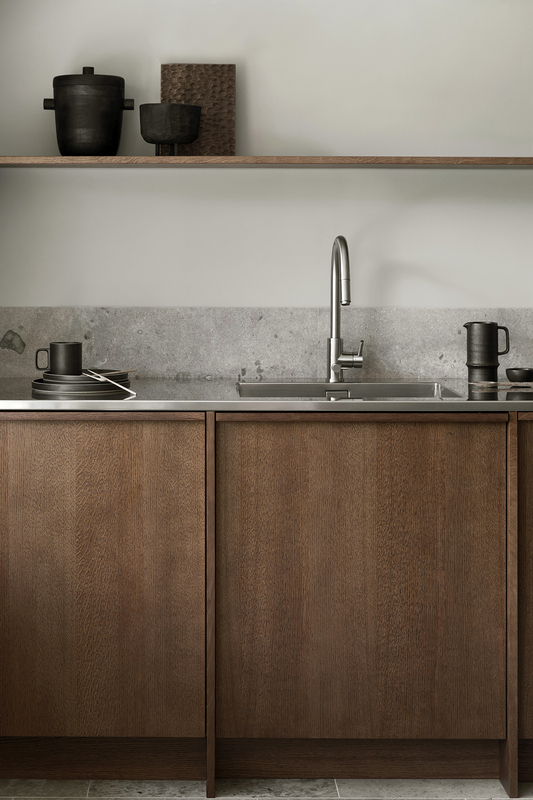 The design is inspired by the Nordic Archipelago and has hidden handles, a steel countertop and a limestone backsplash. 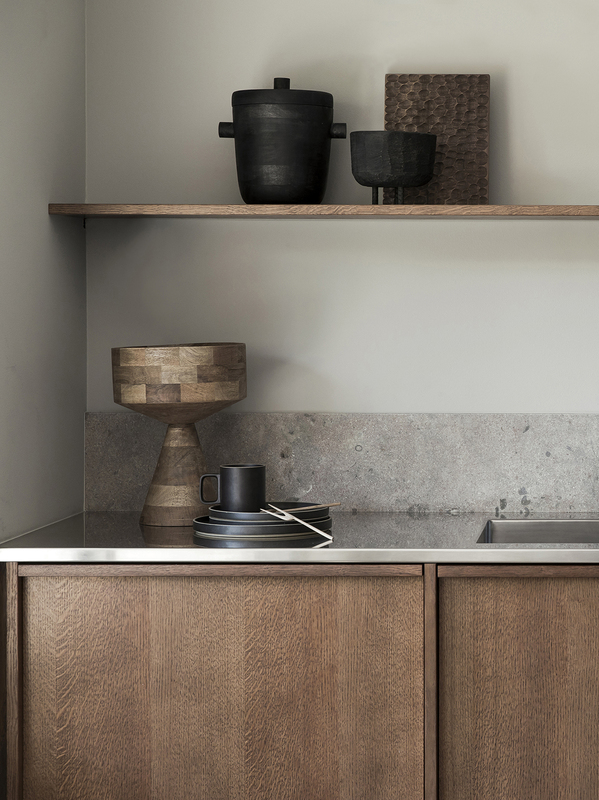 I think these materials contrast very nicely with each other. 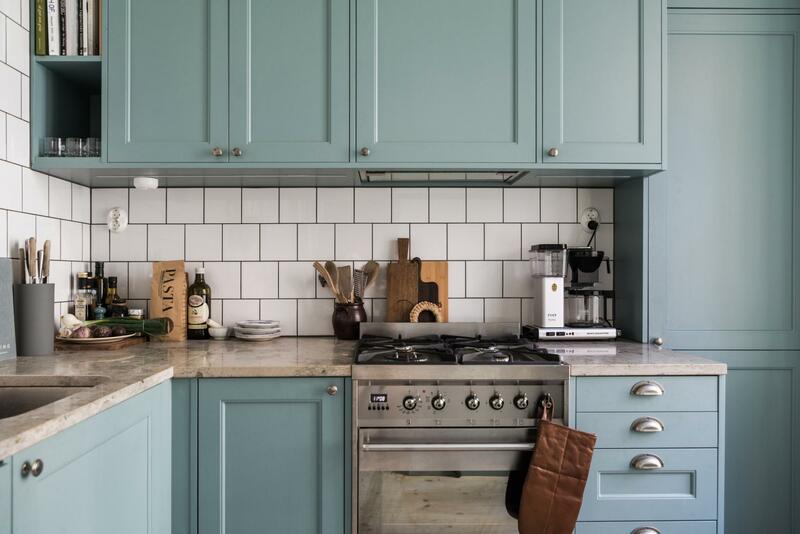 The design of this kitchen is quite classic, however it’s the color that makes it relatively modern and very interesting. 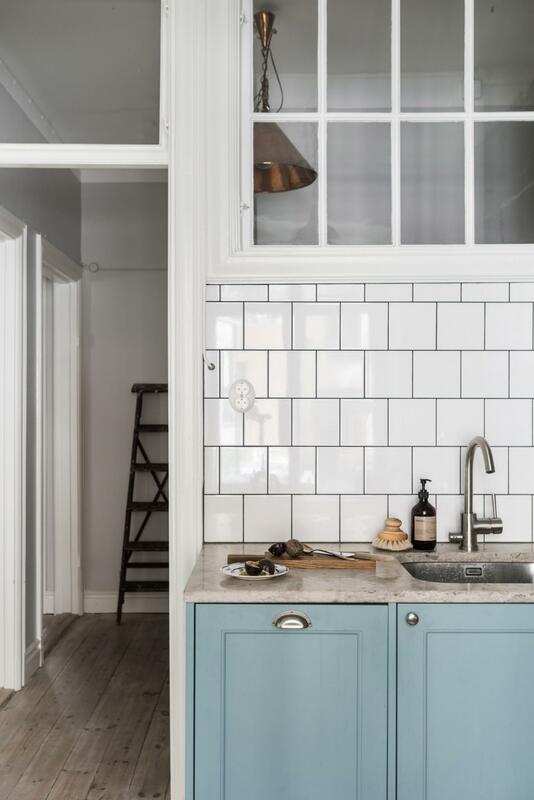 I like the blue-grey fronts combined with the beige stone and the white tiles against the wall. 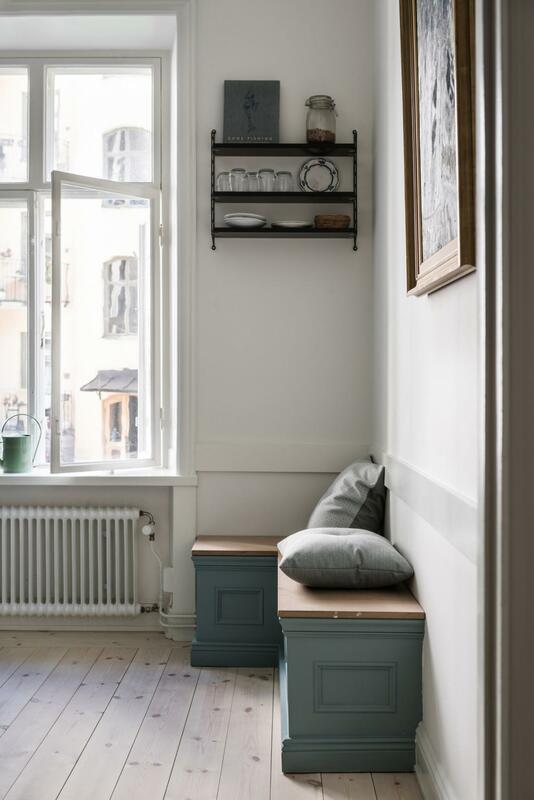 The bench is made into the same color and is a nice touch as well. 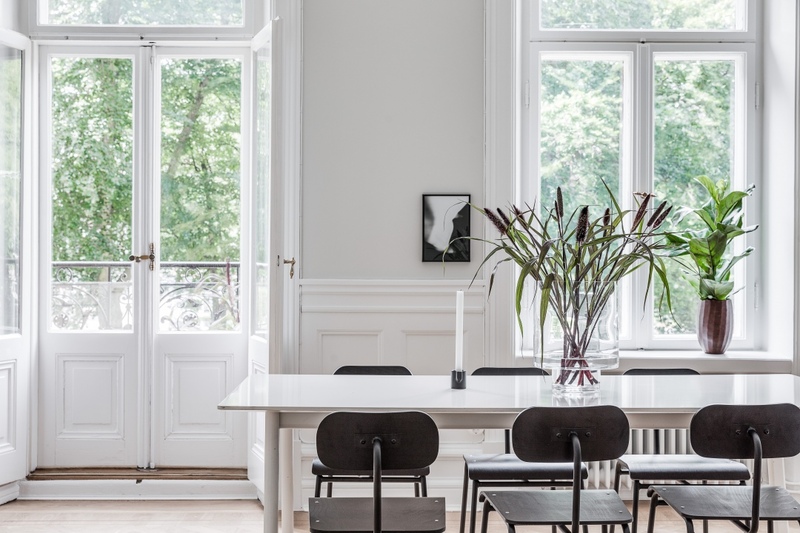 The placement in front of the window would work perfectly combined with a small round kitchen table I think. Our kitchen table from a few weeks back. 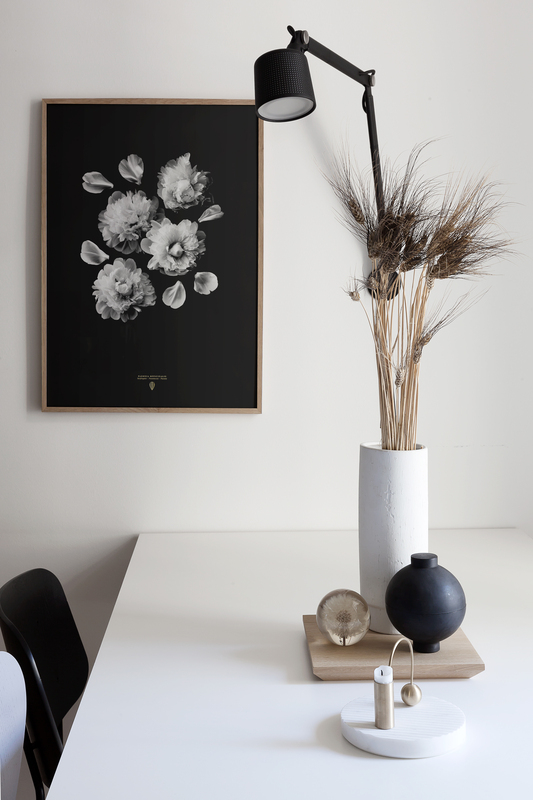 I love the dark Paeonia Officinalis print here next to the Vipp wall lamp and think it will even look better when I paint this wall in a darker color.